If it Looks Too Good to be True, it is - beware anyone bearing gifts, and always check that horse's teeth. One of the interesting parts of the English language is the number of pairs of proverbs which have opposite meanings. You can find lots of examples around the internet, though for me some of them are a stretch. Two many cooks spoil the broth. The implications for investment of the last two in particular are worthy of discussion, but today I want to talk about an even more relevant pair. The first of these – don’t question gifts – dates back to AD 400, but the specific reference to horses refers to the fact that their teeth grow as they age. The implication of the proverb is that anything you get for free is worth having. The second proverb is even older, and has a famous origin: the siege of Troy, recorded by Virgil before 19BC. After a nine-year war, the Greeks offer the Trojans a huge wooden horse, and apparently leave. Despite a warning from their priest, the Trojans roll the horse inside their city and throw a party. Greek soldiers emerge from the horse and kill the Trojans. It’s a happy but misleading coincidence that this second proverb also features a horse. What it really means is don’t trust your enemies. So we can’t follow the advice of both proverbs. Luckily it’s an easy choice. One of the fundamental rules of investing is that nobody is on your side as much as you are. Where money is concerned, conflicts of interest abound. There are many spheres of life where cooperation is a wonderful thing, but investment isn’t one of them. In the context of the proverbs, everybody is your enemy. It’s also simple to show that the first proverb is wrong. There’s a cost to everything, even if it comes for free. In the physical world, your stuff owns you. Without getting all Kiyosaki on you, lots of things that look like assets are actually liabilities. They take up your time, or your money or your attention instead of making you money. They get in your head and make it harder to make the difficult choices. They weigh you down. In terms of a portfolio, a “free” (read originally cheap) position that isn’t keeping up with your objectives is dead money. So look it in the mouth. Impossible promises became much more relevant to UK investors in April 2015 when the “pension freedoms” went live. Lots of people became interested in getting their hands on unlocked pensions cash, including lots of crooks. At the time of writing, I’m four weeks away from accessing my pensions, and I get a scam call every single day. dead people with a name similar to mine. Most of the calls offer a variation on the same theme – a high and consistent return – 8% to 10% pa seems to be the going rate – and safety. Sometimes the safety comes from a physical asset (property, or farmland), sometimes it’s a guarantee of fixed returns from the scheme’s operator or promoter. It looks too good to be true, because it is. Dig deeper, and you’ll find that the returns are “projected” or “typical” or depend on you selling something for more than you bought it for. You aren’t buying productive farmland in East Anglia, you’re buying a field in Costa Rica that will have something planted in it for the first time next year. You aren’t buying a parking space next to Harrods, its next to Glasgow Airport. Your guarantee isn’t from a sovereign government with its own currency, it’s from a two-man firm working out of a Portakabin in Ilford. There aren’t any low-risk, high-return investments, just as there aren’t any perpetual motion machines, instant weight-loss solutions or cures for baldness. To get rich, you have to take risk. At a minimum you have to be prepared that the value of your investments will fluctuate, and you won’t always be able to get back what you put in. Good returns are not consistent, they are variable. The steady returns from Bernie Madoff were the biggest warning sign that he was operating a Ponzi scheme. Good returns do not come in the short-term, unless you get lucky. Patience is a major factor in investment success. Small investors cannot make decent returns from wine, art, classic cars, precious metals or stamps and coins – the cost structures of the industries don’t allow it. Anybody offering you much more than what you can get in a Cash ISA from a high-street bank is not safe – they are risky. Anybody offering you much more than the yield than the FTSE index, or a top-rated corporate bond is probably lying. It’s up to you to make sure you understand the risks, and the deal still works for you. If you don’t understand, don’t part with your money. find out how long you need to be invested; can you get out early? are there penalties? The FCA runs a warning list of scams to avoid. They also recommend that you get impartial advice. That means paying an IFA. If you think that’s money well spent, then go for it. Be sceptical – look for inconsistencies. Even a paid advisor will have an agenda. Luckily it’s never been easier to access the information you need to look after your own investments. 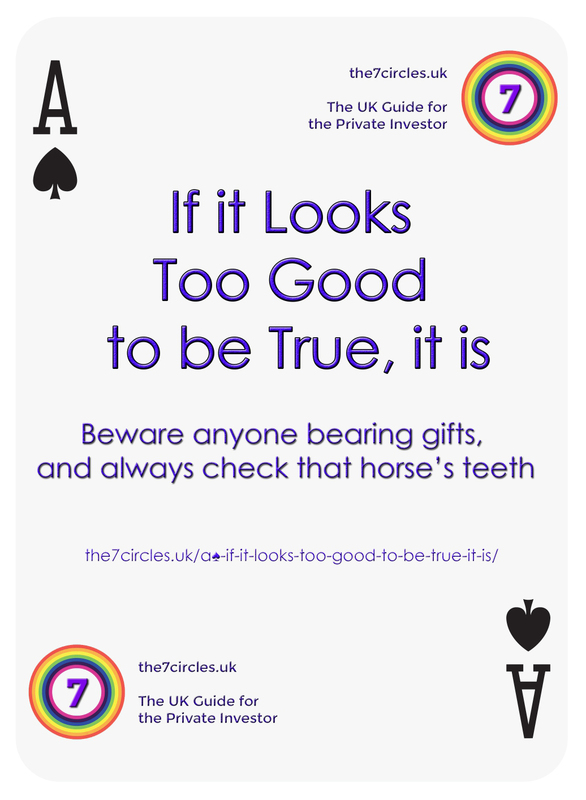 So remember, if it looks too good to be true, it is – beware anyone bearing gifts, and always check that horse’s teeth. Next story Sequencing risk in accumulation – who ate Joe’s pension?